The shuttering of several outposts of Jamie’s Kitchen in 2018 meant that a clutch of prime real estate came onto the market – and just as quickly went off it. An early shopper was Grind, which snapped up the Greenwich site, banking, no doubt, on the heavy footfall generated by nearby Greenwich Market and park. 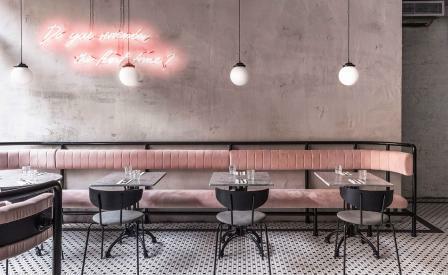 Biasol was tapped to reimagine the 456 sq m space into a deli, cocktail bar and an all-day café restaurant, the Melbourne-based studio carefully investing each area with subtle tonal shifts in the mood-board – pink walls and ceiling in the deli, for instance, paler pink banquettes in the foyer, and a deep turquoise in the bar. The building is heritage listed and faint echoes of its past peek through in the irregular lines of the exposed brick walls, and artfully unfinished concrete finishes. The conservatory, meanwhile, is a dramatic set-piece of light and dense green shrubs, the whole framed by a curved marble-top counter edged in black and white tiles.